knottygnome crafts: I finished my sockotta anklets of shame. I finished my sockotta anklets of shame. Finally finished! what a story these socks have to tell. i started them back in early summer, got through one anklet with no difficulty, then my cats tangled the yarn beyond repair, so i gave them up in disgust. i took them out, dusted them off, cut the tangled yarn and rewound the ball. i've worked steadily for a few rows here and there for another month or two, and i am finally finally done. I used Sockotta self-striping yarn--a cotton/wool blend, knitted on #0 metal dpns. I worked toe up, using the eclectic heel--a heel i was introduced to from someone on socknitters. the author touts it as a combination heel flap/short row heel, but it's more like a regular heel flap and the heel turn rows are wrapped. i might use this heel again, but i would modify it. For being so simple, these socks were a bear for a variety of reasons. besides the kitty demolishing, the yarn feels hard, and it hurts my hands to work with it. the #0 metal dpns also hurt my hands, and i can't stand to work more than a few rows at a time. i can't attest to how these socks feel, as i haven't worn them yet, but in the future i'll probably stick to fixation if i want cotton socks. The photo is not so great, but i started a pair of fixation socks last night. i really love this yarn. it's spongy and comfy to wear, it's sportweight and doesn't take as long to knit, and all of my fixation socks have held up really well, so far. 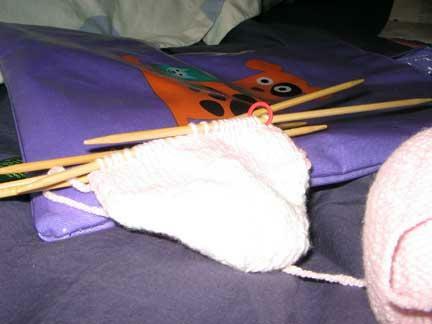 i'm trying out an experiment for these socks, and if it goes well, i'll write up a pattern for them. I have to thank Lolly for inspiring me with Socktoberfest to finish these socks that have been a pox on my existence for far too long. it's been awhile since i've knitted socks, and i'm glad i'm getting back into it. Very cute socks. I haven't used sockotta yet but have a skein in my knitting basket, I'll have to give it a try and see if I have the same issues with it.